Dominique and I travelled to my hometown of Randolph, New Jersey this month. The state championship wrestling team I wrestled on in 1974 was inducted into the Randolph High School Sports Hall of Fame. We attended the dinner and saw old teammates that I hadn’t seen in forty years. The problem with wrestling, unlike golf or tennis, is that it’s hard to find somebody to wrestle with after graduation. So, Dominique and I decided to wrestle with the Appalachian Trail in New Jersey while we were there. 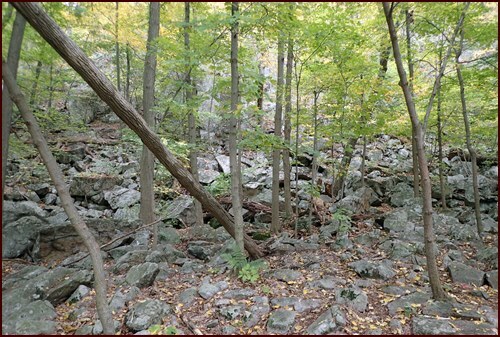 It’s well reported that the Appalachian Trail through Pennsylvania sports the most rocks per square inch of any state. Parts of Virginia and New Hampshire also contend for Most Rocky honors. Somehow, little New Jersey doesn’t get much press, but it should. 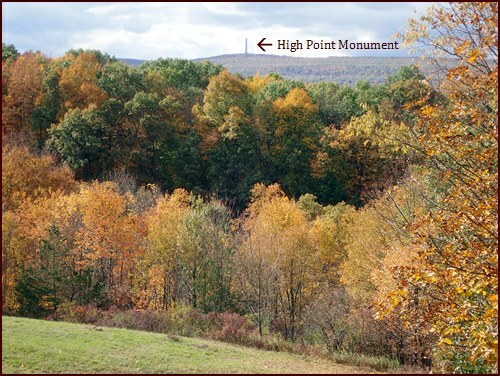 Twenty-one thousand years ago, the Wisconsinan Glacier covered the Kittatinny Mountains and Highlands of Northern New Jersey with a 10,000 foot thick mass of ice – higher than the High Point Monument. The glacier carved out the distinctive ridges and valleys of the area, formed numerous lakes and wetlands, and left behind an unspeakable pile of rocks – with which we became well acquainted over four days of hiking. 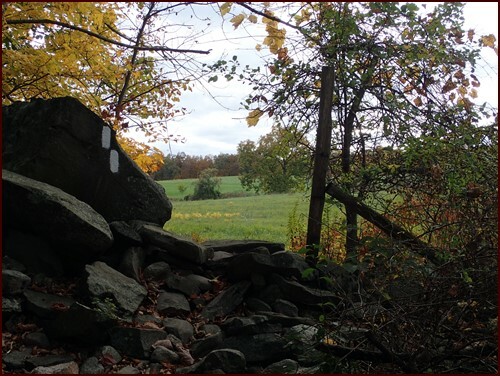 Not surprisingly, one feature you see frequently when hiking the Appalachian Trail in New Jersey is rock walls. The early settlers cut down the trees for fuel and lumber and proceeded to farm the land. First they had to get out the rocks, which they piled up along their property lines. We got dropped off at Wawayanda State Park the first afternoon and spent the night in our tent near the shelter without hiking. We enjoyed a hot Thermos lunch of curry carrot soup when we got there and for dinner we made seafood macaroni and cheese, a variation of tuna mac with shrimp and crab instead of tuna. We met a nice woman from Poland who slept in the shelter. 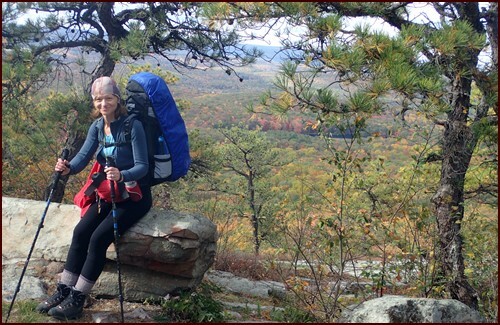 We were surprised that she was in the midst of a southbound thru-hike at this time of year. In the morning, after a beautiful view of the fall-colored forest from atop Wawayanda Mountain, we got our first taste of rocks as we picked our way down the steep backside of the mountain. From there the trail levelled out and passed through wetlands and wild fields in an open valley. 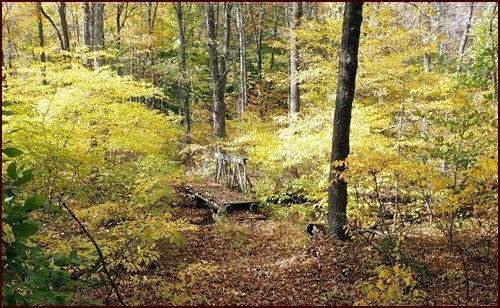 In many places, we hiked on boardwalks or wooden planks above the moist soil. Small ponds and lakes sparkled under the sunlight and teemed with Mallard ducks and Canadian Geese. Later, we reentered the forest and stopped for lunch which I had prepared in the Thermos in the morning. It started raining lightly, but hardly a drop reached us under the large maple tree where we sat on a rock enjoying the splendor of the yellow-orange leaves above us. 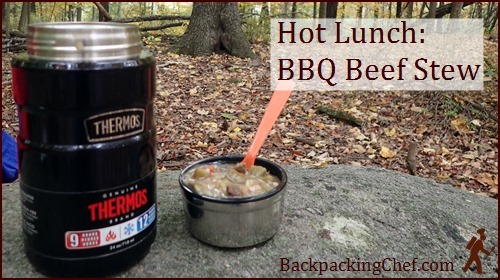 Dominique was so impressed with the lunch – BBQ Beef Stew – that we added it to her list of Hall of Fame Backpacking Meals. Her other favorites which I prepared on this trip were Unstuffed Peppers, Chili, Ratatouille, and Saffron Risotto. To make BBQ Beef Stew, you start by making Potato Bark. That turns into a tangy thick sauce when rehydrated in the Thermos with dried okra and beef. Normally, I use dried ground beef in this recipe, but I wanted to see how beef jerky would rehydrate after several hours in the Thermos. It was wonderful. I had made the beef jerky from top-round sirloin which I cut into strips and marinated for a couple of days in a mixture of Worcestershire Sauce, steak sauce, and balsamic vinegar. I broiled the marinated steak first and then cut it into smaller pieces before putting it in the dehydrator. It was a little chewy in its dried state, but flavorful. Tenderness returned with the long hot soak in the Thermos and made the meal taste – meatier. After lunch we began the rocky and strenuous climb up and over Pochuck Mountain. Late in the afternoon, when we were getting tired, I pulled out the Thermos which I had loaded with dried fruit and cold water after lunch. Dominique loved the refreshing fruit cocktail and we shared one every afternoon of our trip. We ran out of daylight and put on our headlamps for the last mile to Pochuck Mountain shelter. We covered almost twelve miles the first day, more than was wise considering the shorter fall days and rocky terrain, but we were happy to be out in the woods nevertheless. Dominique blew up the sleeping pads and organized our gear for the night while I cooked Saffron Risotto with Mushrooms and Chicken. 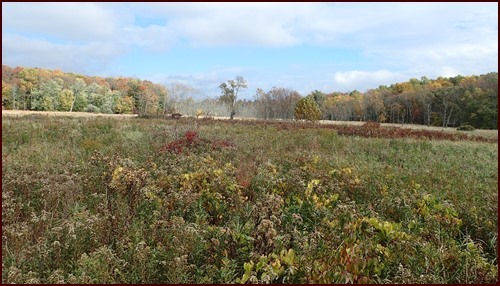 The next day began with a rocky, knee-tweaking decent from Pochuck Mountain and then the trail mercifully passed through the tall grasses, ponds, and wetlands of Wallkill River National Wildlife Refuge. I was happy to see native milkweed growing along the trail, a plant that is essential for the survival of migrating monarch butterflies who flutter all the way down to Mexico. A young, long-bearded thru-hiker named “Three Bears” passed us. He had hiked from Georgia to Pennsylvania and then flip-flopped to hike southbound from Maine. With only 200 miles to go, he hiked on at a good clip. He looked at ease and healthy wearing light shorts and sturdy boots. His calves and thighs had grown sturdy as tree trunks from the journey. The trail went onto a county road for about a mile and then back into the forest. We passed through several hay fields that were bright green from having been recently cut. 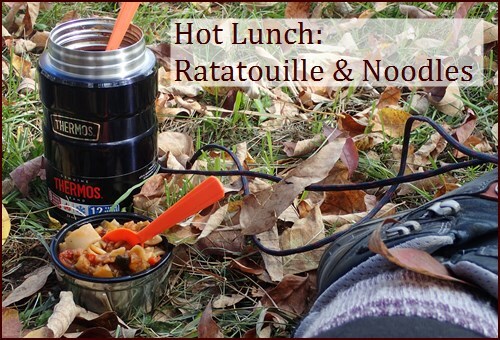 At midday we sat down in one of those fields and enjoyed a Thermos lunch of Ratatouille with Lasagna Noodles. I had precooked and dehydrated the noodles at home, so they rehydrated perfectly in the meal. Fall was in the air – we felt the temperature dropping and wind picking up as leaves blew down from the trees surrounding the field. Later, we passed through another field and saw High Point Monument on a ridge in the distance. I told Dominique that’s where we needed to get to by the end of the day and it looked a lot further off than five miles. Once again, we put on our head lamps for the last hour to High Point Shelter. After another twelve mile day, I cooked Grated Potatoes with Beef & Vegetables for supper. 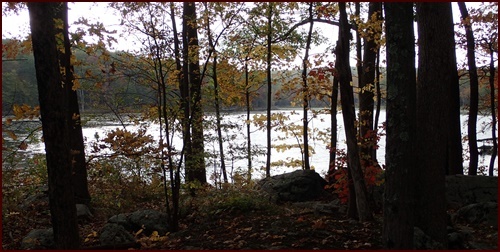 Our original plan was to hike the whole State of New Jersey in six days from Wawayanda State Park near the New York border to the Delaware Water Gap at the Pennsylvania border, but we changed our mind and hiked four days instead. We enjoy taking photos, lingering at beautiful spots, and hiking at our own pace in order to enjoy the trail – even when it is strenuous. Discovering how rock-strewn the trail was, we decided four days would be enough for this trip. We didn’t want to feel compelled to hike a longer distance to achieve the arbitrary goal of completing the whole section in one trip. With the decision made, we relaxed a bit more - a benefit Dominique cherishes as she uses her trail time to unwind from her stressful job. Under the new scheme, we hiked seven miles on the third day instead of the thirteen miles originally planned. There were no steep ascents and descents, but the rocks underfoot were ever-present. On some stretches the rocks were more spaced out. As we scanned six paces of trail in front of us, our brains guided our feet to soft landings without us having to consciously watch every step. It’s amazing how the human brain learns and adapts to assist us. We stopped for a hot Thermos lunch of Vegetable Soup with Chicken & Rice up on the flat rock surface of an exposed ridge with a colorful fall view of a parallel ridge and a neatly manicured horse farm down in the valley. Checking our A.T. Guide, we saw that Mashipacong Shelter, our destination, had no water. We stopped at Rutherford Shelter on the way and filled all of our water bottles and filter bags and carried the extra weight the final three miles so we would have enough water to drink and cook with. It was nice to arrive with a little daylight remaining, but we were eager to climb into our sleeping bags because the temperature was dropping into the 30s. First I warmed our bellies with a pot of Unstuffed Peppers with parmesan cheese. We hiked almost nine miles the last day with outstanding views up on Sunrise Mountain and from the Culver Fire Tower. I didn’t stay up in the fire tower long because the wind was strong, but the panoramic view of the New Jersey Highlands made me smile remembering that I had grown up in such a beautiful state. We ran into a fellow named Howie Liebmann and his adult son at a dry creek bed. Howie is the Northwest New Jersey Trail Chair for the NY-NJ Trail Conference and coincidentally lived in my hometown of Randolph for twenty years. Dominique asked him how far away Gren Anderson shelter was because we needed to get water there. Howie pointed out on his map that we had passed the sign for the shelter a hundred yards back. He kindly walked back with us to make sure we found it. We enjoyed our final Thermos lunch of hot chili and goldfish crackers sitting under a grove of white pine trees that blanketed the ground with aromatic needles. Our hike ended in Branchville, New Jersey where the trail crosses Hwy. 206. Our shuttle driver, George Lightcap, picked us up and drove us back to our car. George has section-hiked the entire Appalachian Trail and has been a trail angel and steward for several decades. We’ll call him again the next time we go back to New Jersey to finish hiking to the Delaware Water Gap. 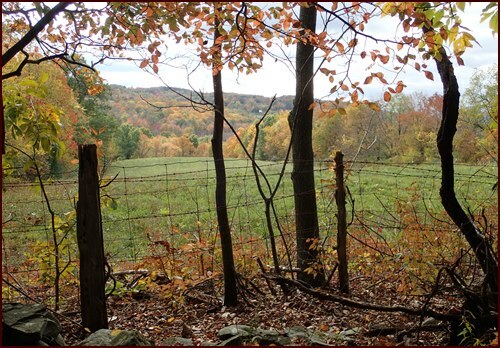 The Appalachian Trail though New Jersey often passes close to private property. It makes me happy to cook Dominique’s favorite backpacking meals on the trail. She really enjoys them. The hot Thermos lunches and fruit cocktails were a big hit with her. Preparing the lunch in the morning simply by adding boiled water to the dried ingredients in the Thermos made it very convenient to stop and eat lunch with no fuss. I also used the thermos to turn fruit leather into juice overnight which we enjoyed with our breakfast. Opting to carry one 24-ounce capacity Thermos, we shared one large serving portion for our lunches, which is about all you can fit in one Thermos. On our next trip, we will include a side item with our lunch such as cheese, beef jerky, or tortillas. I’m curious to know, what are your favorite backpacking meals? What Top 5 Meals make your Hall of Fame? Shoot me a reply with your top picks and feel free to tell me about your own creations. That’s it for this month. I hope you enjoyed the newsletter. 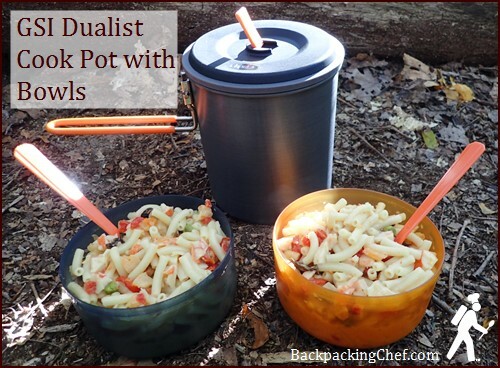 Next month I’ll write up a review of the GSI Dualist Cook Set that we used on this trip. P.S. If you have any questions or comments about this issue of Trail Bytes, please reply to this email or use the contact form at BackpackingChef.com. If you received this newsletter from a friend and would like to subscribe (it's free), click here. Visit my BackpackingChef Facebook page for the lastest posts.